With some great Angry Birds party ideas you can throw a party that is as much fun as hurling birds at those misbehaving little green pigs! 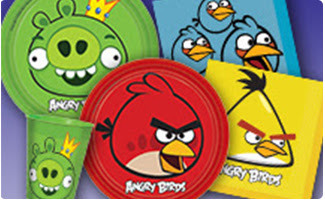 An Angry Birds party is the perfect choice for every Angry Birds fan, be it a boy or a girl. So, if you are looking for Angry Birds birthday party ideas in India, here are bunch of interesting ideas. Holding the party outdoors, in your backyard or at a local party, will give everyone a lot of space to run around at your Angry Birds party. A costume party is a lot of fun for everyone to dress up as their favorite birds. In lieu of this, you can get some red and green shirts and clothing markers to create customized red bird and green pig shirts for all of the party guests to wear. 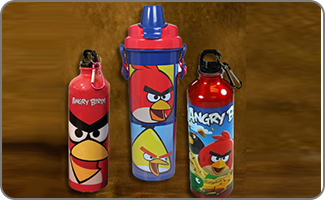 Order your Angry Birds supplies several weeks in advance, so that you can have everything on hand when it is needed for the big day! Try to plan the party on a day when the most number of invited guests can attend. Saturday mornings tend to be filled with chores and sporting events, so consider a Saturday or Sunday afternoon party. 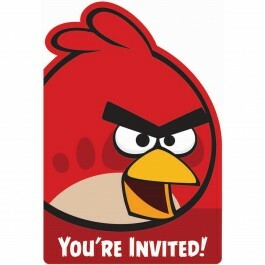 If you want some pre-packaged angry birds birthday invitations in India, our packages of Angry Birds party invitations will help introduce the theme of the party in style, and will save you some time. 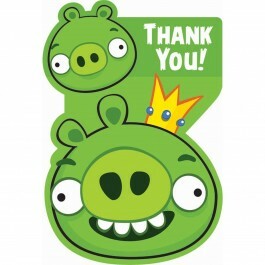 Be sure to pick up some Angry Birds return gifts and thank-you notes at the same time. Green construction paper can allow you to create invitations resembling the enemy green pigs. Add a little gold foil crown to create a King Pig invitation. 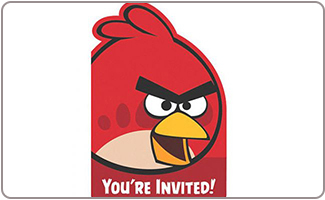 Include an Angry Bird plush pencil topper or eraser with each invitation. These are easily found at any craft supply store. Using craft sticks and strips of leather create miniature slingshots. Attach card-style invitations to the slingshots, with wording that says "Join us for some bird slinging, pig-whacking good fun!" Paint cardboard boxes to resemble wooden crates and cement blocks. Stack them up on a table, with green pig plush toys in between the blocks. 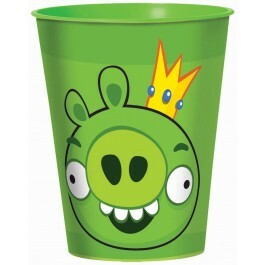 Have the party guests throw plush Angry Birds at the wall, with the goal of knocking down the pigs. Paint plastic bowling pins green and use permanent markers to draw pig faces on them. 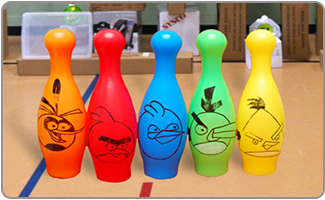 Draw a bird beak and eyes on a red plastic bowling ball, for a rousing game of Angry Birds party bowling. For older party guests, inflate green pig balloons and attach them to a cardboard backdrop. Using darts, the goal of the game is for the guests to pop as many of the pig balloons as they can. Paint cleaned out cans to resemble green pigs and fill them with candy and other Angry Birds return gifts. Along with plastic Easter eggs filled with candy, hide them around the party space for a fun hunting game that everyone can take part in. 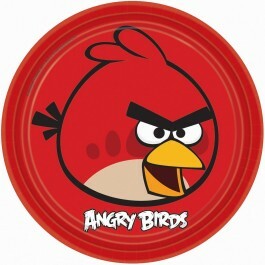 Get some Angry Birds return gifts from our selection of goodies that is sure to give you lots of Angry Birds party ideas. Bouncy balls, yo-yos, blow outs, spinning tops, and pencil toppers, water bottles will be a fun addition to the goodie bags. Angry Birds coloring books, pencils, and also sticker sheets will provide plenty of entertainment. Get some Angry Birds crackers or fruit snacks, available at any grocery store, and include them in the goodie bags to be enjoyed later. 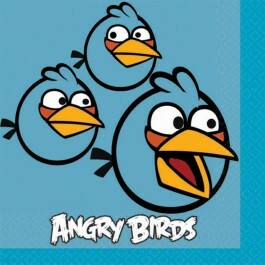 Angry Bird t-shirts, hats, and socks are sure to be crowd pleasers, and are readily available in varying sizes. Some great Angry Birds party ideas for the birthday cakes can include a large cake decorated to resemble one of the birds. You could opt for the red bird, the blue birds, or even the yellow and black bomb birds! 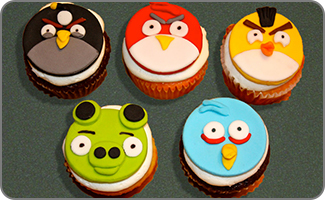 Decorate individual cupcakes to make them each resemble an Angry Bird or a pig. 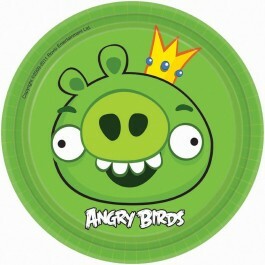 Some Angry Birds party theme cake toppers can help to complete the look of your cupcakes. Miniature personal pizzas can be easily decorated to resemble some of the Angry Birds. Pepperoni, olives, and bell peppers can allow you to let your creativity loose to decorate fun themed pizzas for the kids to enjoy. Another fun alternative is to use flatbreads to create the base for your sandwiches. Decorate the sandwich tops, pizza base or bagels with pepperoni or olives in order to create King Pig sandwiches. Trail mix in a wooden bowl makes a great choice for "bird food" while M&Ms can be a whimsical choice labeled as "bird droppings." Some super Angry Birds party ideas include an Angry Birds party themed pinata that will serve the dual purposes of being a game and a part of the décor. 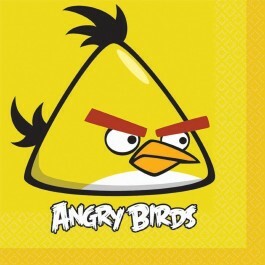 Fill the piñata with Angry Bird stickers, candy, and other return gifts. Large cutouts of Angry Bird pigs and the birds themselves will add a fun vibe to the party space. Choose your favorite Angry Birds level and decorate around that theme. Whether a jungle with palm trees and monkeys, an Angry Birds space ship, or a beach-theme; get creative with the theme you pick. 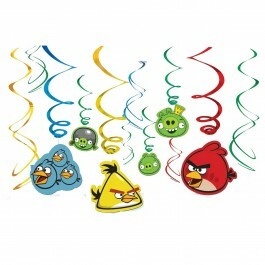 An attractive Angry Birds foil balloon with a loads of mylar balloons will add a super festive vibe to the party. Be sure to attach a few balloons to your mailbox or car antennae in order to mark your party spot. Tie balloons to the chairs at the party, and consider creating balloon bouquets that are weighed down with a plush Angry Bird. 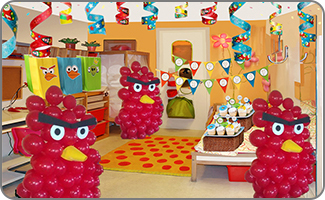 Some Angry Birds birthday party ideas for decorating could also include streamers and birthday banners strung up between doorways or up on the wall. Decorate the party table with a themed tablecloth, paper plates, cups, straws, napkins, and even themed utensils! 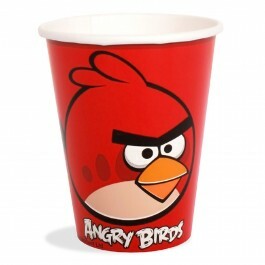 Create centerpieces using Angry Bird plush toys or inexpensive Angry Birds return gifts.